While I was playing FortniteNew Time Mode, Air Royale, my colleague Cecilia looked over my shoulder and said, "This is not a game I once played." Air Royale hardly feels like Fortnite, but it's fun. The new LTM has appeared in today's patch 8.40. 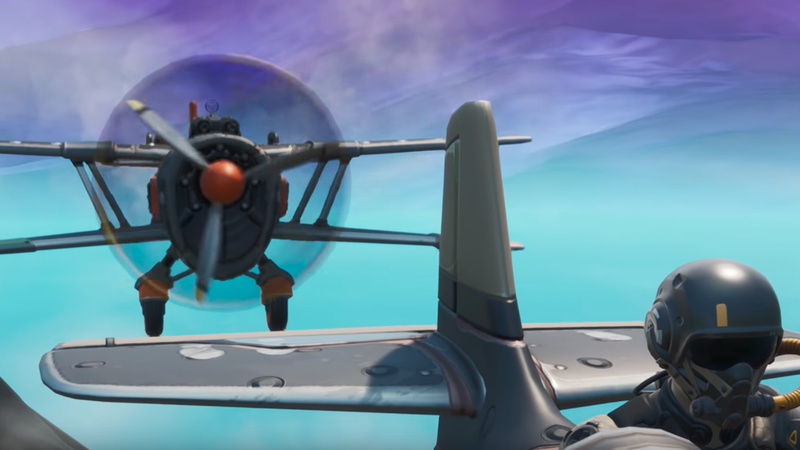 In it, 12 planes are put on Stormwing aircraft, trying to shoot each other, with one wheel, and the other on the plane with weapons and ammunition. You will die if you touch the ground and your aircraft will explode if you land for more than a few seconds. Players have infinite respawns, but the aircraft just reappear twice before you leave the fight. Drop boxes of different levels of rarity can give you a new weapon, and you can also find crates that fix your aircraft and provide you with health and shields. When I read the notes this morning, Air Royale sounded simple. When I actually fell into the match it was chaos. Part of it is on me; I'm miserable when I run a plane and direct his gun. The storm closes in both ends and above you, but I have constantly forgotten about its movement as they fired from all sides. Containers are constantly falling, you mum make your shine, but then disappear when the other player grabs them. When I was running the plane while he shot in my teammate, he would more often flee from the position on the plane, making it difficult to tilt the aircraft to prevent them. They will be killed, vanished, and reappeared, or both will die and suddenly find themselves in replaced rows and fall to the ground as we try to regain our positions. When I fired while the other player was running, the body of the aircraft was constantly coming to my field of vision, which made it difficult to target and shoot. During the first few matches I had no idea what I was doing. When my team took second place in one game, I was shocked. After three games, I realized things, and since then, Air Royale was fun. I finally completed the challenge of "eliminating opponents in different named locations", which has always vanished; in Air Royale i managed to knock down the enemies in the air through Tilted Towers and Loot Lake. It was exciting to go and grab the crate before the other enemy did, or chase someone down while blasting the missiles on their plane. According to patch notes, you can get more respawns for your hijack plane of enemy aircraft, but I have not seen anyone ever done that or even elaborate how to pull it out. The way she hardly feels Fortnite, with a reversal on the chests, completely neglecting the iconic geography of the game and returning the dashed plane. But it's rugged and comfortable in the way many LTM games are. It's a nice break, an easy way to complete the challenge and wonderfully funny. Patch 8.40 also brings what Epic calls the "pet" option FortniteDogs, chameleons and other pets. This is a snippet of this petting action in action. I've tested this for myself, and this clip is correct: pressing the "pet" key will make you unclear the creature in front of you. When I did the pet with other foxwomen, my pet smiled. It's not "petting", Epic. I do not know what it is. Other changes include another LTM called Food Fight: Deep-Fried. This is a reversal in the previous LTM mascot game that adds the lion to the mix. The pedestrian rifle now also has epic and legendary rites. There is a user interface element that now allows you to do the same emotions as the other player if you own it, making those parties in the lobby dance a bit easier. You can check all the changes in the notes and please send Epic to let us pass the dog. We're all better than this.